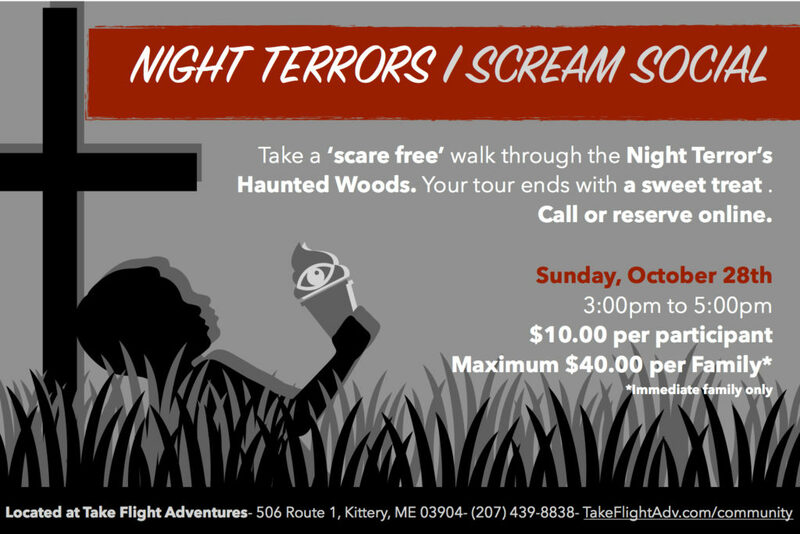 Night Terrors Haunted Walk – Night Terrors Haunted Walk: Never Sleep Again! 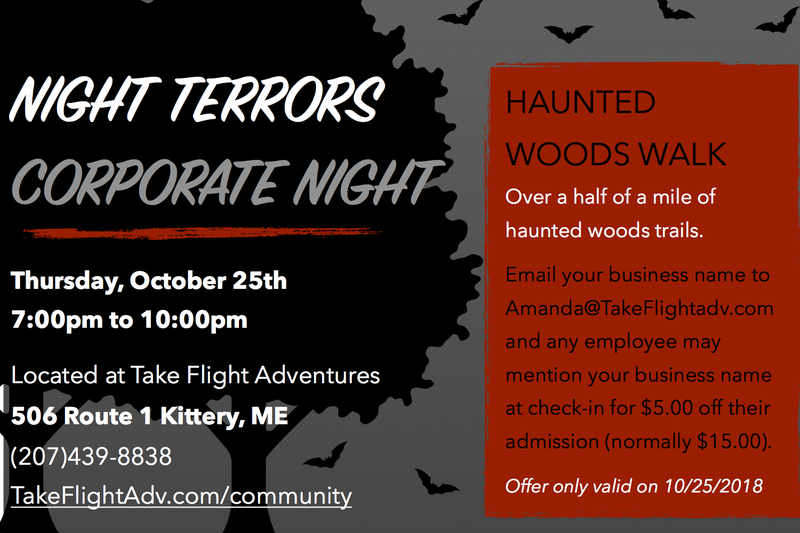 Night Terrors Haunted Woods Walk is Kittery’s premiere haunted walk! Located at Take Flight, stroll through the woods and see what is waiting around each corner. Each night, local school and community groups volunteer as our actors and proceeds from the night are given back to support their programs. Help us have some fun, scream, and give back to the community! 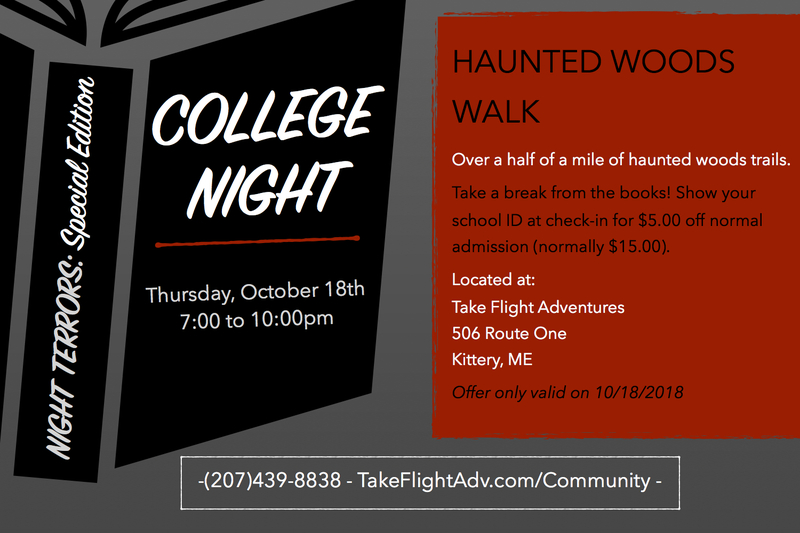 Groups include Traip Academy, York High School Sober Friends, UNH clubs and more! In 2017, all the holidays were twisted and turned by the Halloween spirit. 2018 brings a new twist and some strange visitors. 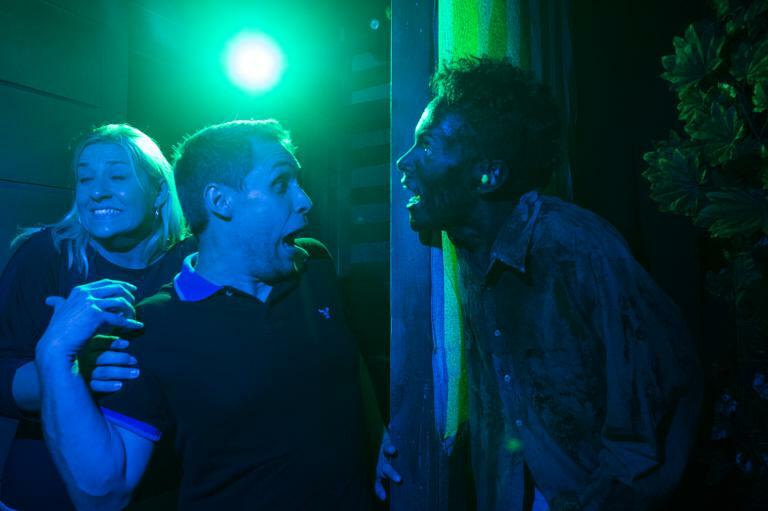 Walk guests are turning into test subjects as they venture through Sci-Corp.
Join us for Halloween scares and thrills for just $15. Tickets may be purchased in advance or at the door. Walk can last anywhere from 30 minutes to over an hour on busy nights. Free parking available on site. Night Terrors is not recommended for young children. CLOSED SATURDAY OCT. 27TH DUE TO WEATHER. Tickets are available through Take Flight's website by clicking "Book Now". Weather cancellations will be posted here and on Facebook. Reservations are available but walk-ins are encouraged. "Eye Scream Social" featuring the Ghostbusters! Why not have some dessert before dinner with a side of Halloween? Join us for our Kid's Scare Free Event on Sunday, Oct. 28th! Go for a walk through the sets of Night Terrors Haunted Woods Walk with our friendly cast of ghosts and ghouls who are serving up a sweet treat inside the walk! This year's kids event will feature an appearance from the North East Ghostbuster Alliance to guide you and catch all those pesky ghosts. Reservations available- Walk-ins welcome. Costumes are HIGHLY ENCOURAGED! Just $10 per person or $40 max per immediate family. Don't forget our other special events!